you can WEAR your crystals and be hands free! 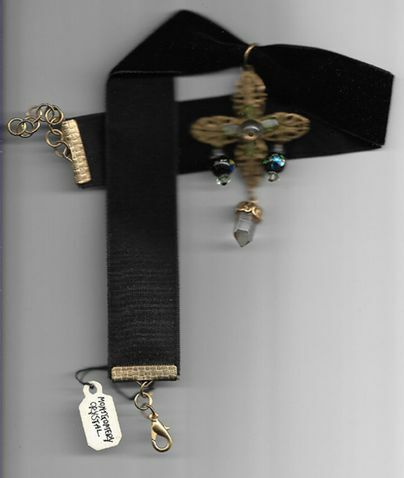 An endlessly fashionable choice is our Filigree Cross Pendant with Arkansas rock crystal and peridot, which comes to you on a black velvet choker. It can be changed out and worn on your own chain, too. Each rock crystal, quartz cluster, rough stone and bead has been chosen for our stock by asking them if they are the right ones to come with us for you. So that much has been settled. When we combine them to make jewelry [and Illuminator tm bookmark/pendulums, Bud Bottles, Jeweled Picture Frames and so forth], it's the crystals, clusters, and stones who choose the beads, findings, ribbons, velvets to be with. It's also the way your gift crystal or cluster is found and sent to you. Take a moment to reflect on that...and you might like to see the feedback page, too! REMINDERS: 1- Yes, we ship worldwide, even to Russia. 2- Every item shown is available ONLY from our site, so be sure you are not ordering from any other web address. 3- If you have questions, please email us at montgomery@hvc.rr.com before you order.